First base isn’t where you’d expect to see a low-power, slick-fielding player. Those players you’ll typically see in an up-the-middle position. The same goes for left field. On the defensive spectrum the two positions furthest to the right — that is, positions that are the least difficult to play — are left field and first base. We can also lump in DH and right field with those. Unsurprisingly, those positions produced the most power in 2010. Of the top 10 finishers in ISO, nine played first base, an outfield corner, or DH. Only Troy Tulowitzki at No. 10 broke the trend. This isn’t to say that a hulking slugger is required at these positions. There are ways to produce runs beyond the homer. But power is undoubtedly part of the game, and if a team isn’t getting power out of left field and first base it must come from elsewhere. Unfortunately, slugging shortstops and catchers are not commonplace. But in 2010 the Yankees and the A’s proved that power isn’t everything. They both fielded mostly powerless players in one of those two positions, and were both better for it. The A’s got quite a steal after the 2004 season when they traded Mark Mulder for Dan Haren, Kiko Calero, and Daric Barton. Haren stepped right into the rotation while Calero became a bullpen fixture. Barton was the project, a first baseman waiting in the wings. Scouts didn’t think he’d hit for much power, which kept down his prospect ranking, but he did improve on that in the minors. But when he came up to serve as the A’s first baseman in 2008 it did appear as though he’d have trouble putting the ball in the seats. Yet in the last two years he showed that he could succeed without the long ball. Last year in particular he showed what he can do given the chance. In 686 PA he managed a mere .131 ISO, second lowest, to James Loney, among qualified first basemen. He matched Loney’s 10 home runs. But even with the power handicap he still managed a .359 wOBA, which was 44 points higher than Loney’s. It ranked just 12th among first basemen, but that’s still the top half of the league. When combined with his defense — 12.1 UZR — he produced 4.9 WAR on the season, which ranked sixth among qualified first basemen. That’s quite a feat for someone with such little power at a power-heavy position. In the winter after its 2009 World Series victory, the Yankees had a tough decision to make regarding left field. Johnny Damon was a free agent, but the Yankees weren’t sold on his ability to field his position. They made him an offer early, but were rebuffed. As the winter wore on it became clear that the team wanted to give Brett Gardner a shot at the position. Gardner had actually broken camp in 2009 as the team’s starting center fielder, but lost the position to Melky Cabrera after a few weeks. A big bounce back again opened the Yankees’ eyes to Gardner. As expected, Gardner produced little power in 2010. His .103 ISO ranked 14th out of 18 qualified left fielders. Yet he managed a .358 wOBA, which ranked seventh. When factoring in defense — Gardner led all left fielders with a 21.9 UZR — he produced 5.4 WAR, which ranked sixth among left fielders. The next closest to him produced 4.2 WAR. In 2009, despite hitting for far more power, Damon produced just 3.3 WAR. By placing a non-traditional player in a power role, the Yankees actually managed to upgrade at the position. While defense plays a large role in how Gardner and Barton are valued, they’re also potent weapons on offense. What they lack in power they compensate for with discipline. Barton ranked first in the majors with a 16 percent walk rate, while Gardner wasn’t far behind at 13.9 percent. This leads to higher OBPs, and therefore more value at the plate. It’s actually eerie how similar the two players have become on offense. Playing good defenders with little power in up-the-middle positions makes intuitive sense. Since those positions are more difficult to play, there is a limited pool of players available for them. At the corners, which are a bit easier to defend, teams can afford to put in bigger players with power. But as the A’s and the Yankees showed this year, there are alternatives. 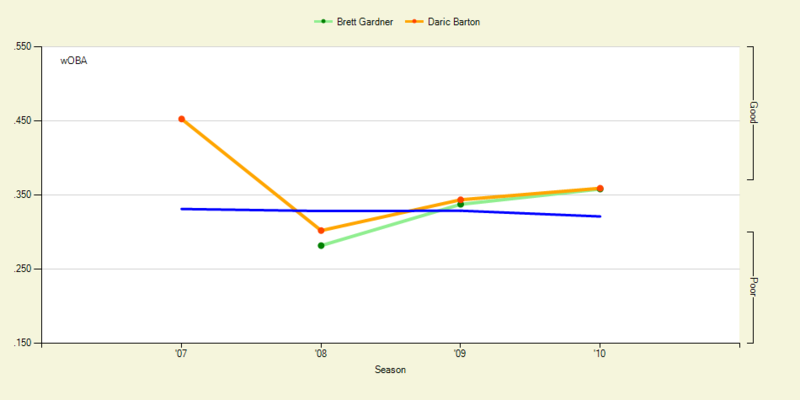 Both Brett Gardner and Daric Barton produced more value than many of their slugging peers. With a combination of discipline at the plate and deftness in the field they were able to break the mold of traditional left fielders and first basemen. Perhaps we’ll see more teams in the future look to this model when they have a hard time finding a slugger to play those positions. We hoped you liked reading Barton and Gardner Produce Without Power by Joe Pawlikowski! Was Joey Votto’s Breakout Predictable? i hope the yanks give gardner the starting job next year too and don’t sign crawford or a slugging left fielder. having gardner and granderson’s defense in the OF is huge for the team, not to mention gardner’s ability to get on base and wreak havoc on the basepaths. in fact, i think the yankees don’t need any FA position players this year, just pitching and lots of it. except for CC and Mo, i don’t completely trust any of their pitchers. gardner could have a really down year and still be an asset because of his salary. and even if his average falls, he will still have above average walk rates. also speed doesnt go into slumps (although the OBP could). and his defense added 2 wins this year, so even if he doesn’t hit well, he can still be valuable on defense and a good number of steals, even with a decreased OBP. i also feel like if he doesn’t hit well, he will bunt more and perhaps be even more patient, just to get on base. On the other side, I see Gardner as being a pretty valuable trade piece. He’ll be about 28 years old while starting his second full season, and I’m not sure he has much room for growth. I imagine there would be lots of interest for a guy like him at that price.